RAWR! ... 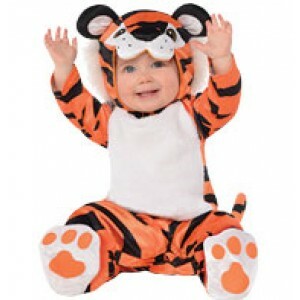 This tiger jumpsuit features all-over stripes and a velcro release tiger tail. Up the "aww" factor with the tiger head character hood featuring a tiger face, plush ears, and white faux fur. Baby's ready to crawl and prowl in the matching tiger paw booties! Age: 0-6 Months, 6-12 Months, 12-18 Months. Fastening: Jumpsuit has Velcro and popper fastening. Hood has Velcro fastening. Tail attaches with Velcro. Includes:	Jumpsuit, hood and booties. Cleaning Care: Hand wash only.